James Moore is a shellfish pathologist with the Department of Fish and Wildlife. 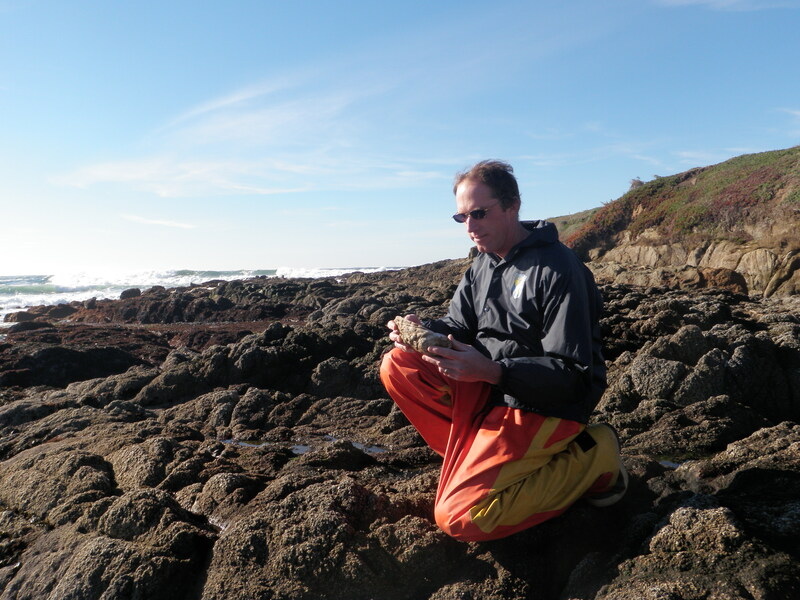 He leads CDFW’s Shellfish Health Program and has been with the department since 1999, working at the Bodega Bay facility. Moore earned his B.A. degree in biology from UC Santa Cruz and a Ph.D. in fisheries from the University of Washington. His dissertation focused on the characterization of an infectious cancer of mussels in the Pacific Northwest. As the state’s sole expert in shellfish disease, he considers it a privilege and a serious obligation to identify and address the issues of greatest concern for shellfish resources throughout the state. Q: What is a shellfish pathologist and what are your primary roles within the Department? A shellfish pathologist investigates diseases of shellfish–oysters, abalone, clams, crabs, etc. In the shellfish aquaculture industry there is a constant need to move animals at various life stages from one place to another. For example, there are no oyster hatcheries in California; all of the oysters grown here were born in Oregon, Washington or Hawaii and are imported as larvae or small seed. Similarly, a few large abalone farms within California sell small abalone seed to farmers in other locations. One of my most important tasks is to prevent the spread of disease or invasive species with such movements of shellfish. Other tasks include tracking disease in wild shellfish populations, assisting with the recovery of endangered abalone and native oysters, assuring activities taken under the authority of Scientific Collecting Permits do not result in disease or invasive species transfer, and regulating marine public and research aquaria to assure that their practices do not result in the release of pathogens or invasive species. I also oversee the detection component of the department’s invasive freshwater mussel early identification program. Q: How big of an industry is shellfish aquaculture in the state? Shellfish aquaculture is happening throughout the state with farms ranging from Carlsbad Lagoon to Humboldt Bay. Culture of oysters, abalone, mussels and clams employs hundreds of Californians and contributes about $30 million to our economy. Oyster aquaculture is increasingly viewed as a remarkable method of food production with no feeding, minimal energy input and, therefore, an extremely low-carbon footprint. There is considerable interest in expanding oyster aquaculture since the demand in California greatly exceeds current production, resulting in need to import product that is more expensive and costly to the environment. Q: You have published nearly 20 peer-reviewed studies since becoming a member of the department. Are there any particular studies that stands out for you and why? My lab conducts applied research that is needed by the department for effective shellfish resource management–generally the type of research that is not provided by academia. For example, our 2011 paper investigates the effects of future El Niño events on abalone at San Miguel Island. This information aids policymakers in the process for consideration of an experimental fishery at the island. Another that stands out is our paper demonstrating that the Department’s response to sabellid worm infestations at abalone farms succeeded in preventing establishment of this non-native pest in the wild. Q: What current research are you doing and what is the significance? We are responsible for managing the health of five captive populations of white abalone and are hopeful that 2013 will be the first year of spawnings that result in outplanting of the progeny, as called for in the recovery program for the species. We are just completing a study on the growth, health and reproduction of native oysters in San Francisco Bay that will aid future restoration efforts for that species. We are tracking the northerly spread of the agent of abalone withering syndrome and investigating how much impact it may have on the red abalone recreational fishery. And, we are gearing up to begin addressing an important viral disease that affects oyster populations in some regions of the state. Q: What are some of the biggest threats or stressors to California’s shellfish populations? The biggest threats are disease agents present in other parts of the world that must be prevented from reaching our wild and cultured shellfish populations. This can be done with effective regulations, education and compliance inspections of importations for aquaculture, research, terminal food markets and the aquarium trade. Various forms of pollution remain a threat. Ocean acidification resulting from increased carbon dioxide in the atmosphere represents a poorly understood but potentially catastrophic threat to California shellfish. Q: How did you become interested in shellfish pathology? I knew that I wanted to be a marine biologist since the age of about nine and did my undergraduate studies at UC Santa Cruz, which had a strong program in shellfish biology. For graduate school, I wanted to study something important in shellfish aquaculture, where the main topics are genetics, nutrition and disease. One day my advisor said, “You are interested in disease, right?” and I said, “Um, sure,” and was paired up with a professor who is a leading expert in shellfish disease. Q: You spent a couple years in the Peace Corps after graduating from college. Would you describe your experience and how it impacted you personally and professionally? It was a mix of very contradictory experiences–very exciting and very boring, rewarding and seemingly pointless. But overall it was beneficial to me and the host country (Federated States of Micronesia). It made me aware that people around the world are not that different and made me appreciate all that we have in this country. The experience was viewed very positively by future employers and providers of grants and scholarships. Elston R. A., Moore J., Abbott C. A. 2012. Denman Island Disease (causative agent Mikrocytos mackini) in a new host, Kumamoto oysters Crassostrea sikamea. Diseases of Aquatic Organisms 102:65-71. Moore J. D., Juhasz, C. I., Robbins T. T. 2011. A histopathology survey of California oysters. California Fish and Game 97:68-83. Moore J. D., Marshman B. C., Chun C. S. Y. 2011. Health and survival of red abalone, Haliotis rufescens, from San Miguel Island, California, USA, in a laboratory simulation of La Niña and El Niño conditions. Journal of Aquatic Animal Health 23:78-84. Rogers-Bennett L., Dondanville R. F., Moore J. D., Vilchis L. I. 2010. Response of red abalone reproduction to warm water, starvation, and disease stressors: Implications of global warming. Journal of Shellfish Research 29:599-611. Moore, J. D., Juhasz C. I., Robbins T. T, Vilchis I. 2009. Green abalone, Haliotis fulgens, infected with the agent of withering syndrome do not express disease signs under a temperature regime permissive for red abalone, Haliotis rufescens. Marine Biology 156:2325-2330. Rosenblum, E. S., Robbins, T. T., Scott, B. B., Nelson, S., Juhasz, C., Craigmill, A., Tjeerdema, R. S., Moore, J. D., Friedman, C. S. 2008. Efficacy, tissue distribution, and residue depletion of oxytetracycline in WS-RLP infected California red abalone Haliotis rufescens. Aquaculture 277:138-148. Moore J. D., Juhasz C. I., Robbins T. T., Grosholz E. D. 2007. The introduced sabellid polychaete Terebrasabella heterouncinata in California: transmission, methods of control and survey for presence in native gastropod populations. Journal of Shellfish Research 26:869-876. Ciocan C. M., Rotchell J. M., Moore J. D. 2006. The role of cancer genes in the development of haemic neoplasia in Mytilus sp. Marine Environmental Research S147-S150. Moore J. D. 2006. Bonamiasis of oysters. In: Suggested procedures for the Identification of Certain Fish and Shellfish Pathogens, 6th ed. Fish Health Section, American Fisheries Society. Vilchis L. I., Tegner M. J., Moore J. D., Friedman C. S., Riser K. L., Robbins T. T., Dayton P. K. 2005. Ocean warming effects on growth, reproduction, and survivorship of southern California abalone. Ecological Applications 15:469-480. Rosenblum E. S., Viant M. R., Braid B. A., Moore J. D., Friedman C. S., Tjeerdema R. S. 2005. Characterizing the metabolic actions of natural stressors in the California red abalone, Haliotis rufescens using 1H NMR metabolomics. Metabolomics 1:199-209. Braid B. A., Moore J. D., Robbins T. T., Hedrick R. P., Tjeerdema R. S., Friedman C. S. 2005. Health and survival of red abalone, Haliotis rufescens, under varying temperature, food supply, and exposure to the agent of withering syndrome. Journal of Invertebrate Pathology 89:219-231. Moore J. D., Finley C. A., Robbins T. T., Friedman C. S. 2002. Withering syndrome and restoration of Southern California abalone populations. California Cooperative Oceanic Fisheries Investigations Reports 43:112-117. Moore J. D., Cherr G. N., Friedman C. S. 2001. Detection of “Candidatus Xenohaliotis californiensis” (Rickettsiales-like procaryote) inclusions in tissue squashes of abalone (Haliotis spp.) gastrointestinal epithelium using a nucleic acid fluorochrome. Diseases of Aquatic Organisms 46:147-152. Moore J. D., Robbins T. T., Hedrick R. P., Friedman C. S. 2001. Transmission of the Rickettsiales-like procaryote “Candidatus Xenohaliotis californiensis” and its role in withering syndrome of California abalone Haliotis spp. Journal of Shellfish Research 20: 867-874. Antonio D. B., Andree K. B., Moore, J. D., Friedman C. S., Hedrick R.P. 2000. Detection of Rickettsiales-like prokaryotes (RLPs) by in situ hybridization in black abalone Haliotis cracherodii with Withering Syndrome. Journal of Invertebrate Pathology 75(2):180-182. Friedman C. S., Andree K. B., Beauchamp K., Moore J. D., Robbins T. T., Shields J. D., Hedrick R. P. 2000. “Candidatus Xenohaliotis californiensis”, a newly described pathogen of abalone, Haliotis spp., along the west coast of North America. International Journal of Systematic and Evolutionary Microbiology 50:847-855. Moore J. D., Robbins T. T., Friedman C. S. 2000. Withering syndrome in farmed red abalone, Haliotis rufescens: Thermal induction and association with a gastrointestinal Rickettsiales-like procaryote. Journal of Aquatic Animal Health 12:26-34. Andree K. B., Friedman C. S., Moore J. D., Hedrick R. P. 2000. A polymerase chain reaction for detection of genomic DNA of a Rickettsiales-like prokaryote associated with Withering Syndrome in Black Abalone (Haliotis cracherodii). Journal of Shellfish Research 19:213-218. This entry was posted in Profiles and tagged abalone, Aquaculture, Bodega Bay, clams, crab, mussel, Ocean acidification, oyster, pollution, red abalone, shellfish, white abalone by carolsingleton. Bookmark the permalink.